Punk rock, mosh-pits and sold-out stadiums. I am thrilled to be attending the direct from Broadway, smash-hit musical AMERICAN IDIOT, based on Green Day’s GRAMMY® Award-winning multi-platinum album. I love me some Green Day. As you know, wine doesn't just pair with food. It also pairs with music, people and experiences. So, what does one pair with Green Day? 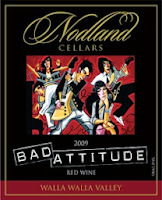 Syrah screams guitar but this band has an edge and for that reason I'm choosing a wine with some serious attitude and a coming-of-age price point of just under $15 a bottle. 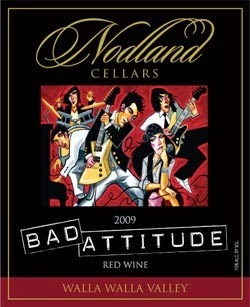 Please join me in raising a glass of BAD ATTITUDE by Nodland Cellars. This red blend is artfully comprised of Merlot and Petit Verdot grapes from Walla Walla, WA. This is a BIG wine to jam to with blueberries, ripe plums, cherries, with traces of violets, chocolate and spice. In this case, drinking bad is very good. Seriously, how lucky are we that Broadway comes to us? Cheers to the theater passionate folks at West Coast Entertainment. Year-after-year they deliver National tours to the INB Performing Arts Center right here in Spokane, WA. Those things you've always intended on doing....Well, you should really do them. Like taking the opportunity of witnessing this show November 22-23, 2013. Do it! You know you want to. Tickets available at TicketsWest. Like with all good Broadway, there's a story to sung. This one encompasses three lifelong friends, forced to choose between their dreams and the safety of suburbia. Their quest for true meaning in a post 9/11 world leads them on the most exhilarating theatrical journey. 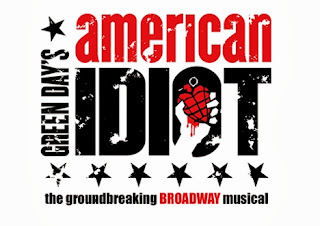 I can't wait to take in Green Day hits like “Boulevard of Broken Dreams,” “21 Guns,” “Wake Me Up When September Ends,” “Holiday” and of course the title track, AMERICAN IDIOT. Besides I already know what wine to pair it with. Here's a sneak peak. There a screening of the making of the stage show. Film length is approx. 1 hour and 20 minutes. Documentary trailer contains adult language and strong content.